Turkey Tail Mushroom and Comfrey Essence Partners is unique in our line of essences. When you purchase this combo, you will receive two bottles: one bottle of Turkey Tail Mushroom Essence and one bottle of Comfrey Flower Essence. 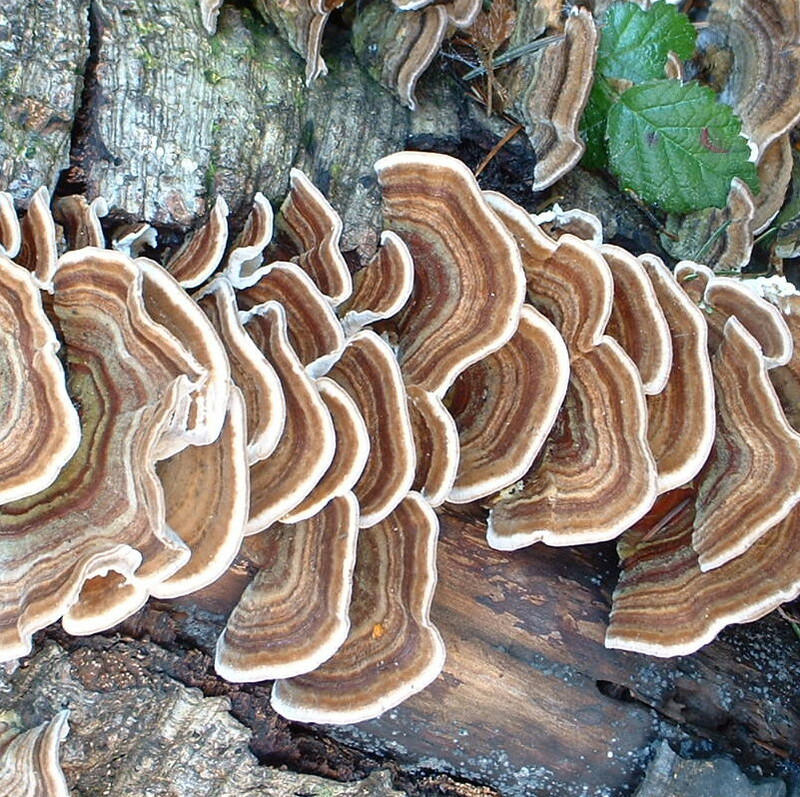 Turkey Tail Mushroom (Trametes versicolor) – Decomposes the energetic structures at the cellular level that hold the memories of childhood, tween or teen trauma and offers a gentle heart soothing sense of safety. Comfrey (Symphytum officinale) - Aids in the healing of wounds so deep and traumatic that they affect your soul's journey. Encourages feeling emotionally and physically safe, and engenders tenderness, self-compassion and joy during this deep healing process. I AM decomposing trauma patterns and offering safety. I AM comfort and solace for your soul during your deep healing process. Mushrooms are the fruit of mycelium that grow underground or in trees. Turkey tail mushroom has a tough shelf-like shape that is striped like a turkey’s tail with a range of colors from buff to reddish brown. The underside is covered with a cream to buff spore layer. Turkey tail is one of the most common mushrooms and grows in boreal, temperate, subtropical and tropical regions worldwide. It is found mostly on dead hardwood trees and can also thrive on conifers. It is a decomposer and breaks down the cellulose of the dead tree or limb. 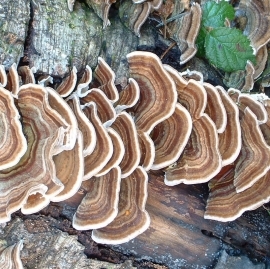 Turkey tail mushrooms have been revered in Europe and Asia for hundreds of years for their healing properties. They were boiled to make soups or teas as way to extract the natural medicine. Modern research is finding that turkey tail mushroom and its mycelium have significant anti-cancer and immune system building properties. It is also highly antimicrobial. In addition to their healing properties for people, turkey tail mushrooms are also being used in ecological restoration to stop the progress of invading blight fungi in forests and to absorb mercury from water. Comfrey is indigenous to Europe and now grows in temperate climates around the world. Comfrey herb is known as a healer of bruises, sprains, fractures and broken bones. It also soothes bruises, scrapes, boils and psoriasis. Use Turkey Tail Mushroom Essence when you are ready to break down and release the patterns and memories of childhood, tween or teen abuse or trauma. For a time these may be necessary for survival. However, continuing to hold these energies after they are no longer useful can lead to symptoms such as fibromyalgia, autoimmune disorders, fear, powerlessness or disassociation. Use Comfrey Flower Essence when you experience very deep emotional and psychological wounds that are usually from trauma, abuse and shock. The wounds could be recent or very old, from this lifetime or a past life. Turkey Tail Mushroom Essence works deeply through the energy circuits that influence chemical structures at the cellular level to release imprints of childhood, tween or teen abuse or trauma. It is a potent decomposer that also offers a gentle heart soothing sense of safety and begins the process of rebuilding physical vitality. Comfrey Flower Essence completes the healing that the Turkey Tail Mushroom Essence initiates. Comfrey starts through the energy circuits that influence the body to rebuild cellular structures that support your continued healing and growth. Comfrey flower essence aids healing wounds of your soul, and encourages you to feel safe in your body and life during this deep healing process. Because of this symbiotic process, we sell Comfrey Flower Essence with Turkey Tail Mushroom Essence. Generally 1 drop of Turkey Tail Mushroom Essence is taken with 2 to 3 drops of Comfrey Flower Essence. Turkey Tail Mushroom Essence was made by the “no-pick” method of working directly with the plant spirit. Crystals of amber, bloodstone, drusy quartz, icosahedron cut quartz, ocean jasper, pink calcite (opaque), red jasper, smokey quartz and white & red stilbite were placed among the plants with the storage (mother) bottles during this process. The sun acts as a transformer to step down spiritual energies from higher dimensions. While the essence was being made, Amber acted as a lens to receive and focus sunlight for this purpose. Amber aligns the subtle bodies with the physical bodies, transmutes negative energy into positive energy, and emits a sunny and soothing energy that calms and enlivens the disposition. Bloodstone is an intense healing stone that helps to balance your body while your energy fields realign. It also facilitates admittance to the spiritual realms of the ancestors. Drusy quartz crystals help to energize and stabilize your subtle bodies. Icosahedron cut quartz has 20 (5X4) equilateral sides. It is a bridge between the 5th Dimension - the entry into the unified Spiritual realms - and the 4 cardinal directions (N, S, E, W) on Earth. Ocean jasper is calming and protective. It heals emotions, lifts your mood, brings joy and peace. Pink calcite (opaque) assists you to gently release old emotional patterns that you have outgrown while supporting and uplifting your heart. Red jasper instills physical vitality, emotional balance, and personal integrity. It assists you to move forward with zest instead of feeling powerless to change your life. Smokey quartz is a premier grounding stone that helps you be more embodied and engaged with the world. White and red stilbite has a calming influence and brings inner peace that frees your Self. Comfrey flower essence was made by the “no-pick” method of working directly with the plant spirit. Crystals of amber, blue phantom quartz with blue tourmaline inclusions, drusy quartz, icosahedron cut quartz, pink calcite (opaque), pink Lemurian seed crystal, selenite, shaman stone and smokey quartz were placed among the plants with the storage (mother) bottles during this process. The sun acts as a transformer to step down spiritual energies from higher dimensions. While the essence was being made, Amber acted as a lens to receive and focus sunlight for this purpose. Amber aligns the subtle bodies with the physical bodies, transmutes negative energy into positive energy, and emits a sunny and soothing energy that calms and enlivens the disposition. Blue Phantom Quartz (with blue tourmaline inclusions) has a comforting resonance, releases fear and emotional stagnation and aligns your emotional body. It activates the throat chakra and encourages you to speak your feelings. Drusy quartz crystals help to energize and stabilize your subtle bodies. Icosahedron cut quartz has 20 (5X4) equilateral sides. It is a bridge between the 5th Dimension - the entry into the unified Spiritual realms - and the 4 cardinal directions (N, S, E, W) on Earth. Pink Calcite (opaque) assists you to gently release old emotional patterns that you have outgrown while supporting and uplifting your heart. Pink Lemurian seed crystal instills a gentle, loving and strong connection with the Divine Feminine through the heart chakra. Selenite clears confusion, helps you understand what has been happening on the subconscious level and instills deep peace. It assists you to access angelic guidance and anchors the light body with physical body. Shaman stones are guardians during the healing process, providing psychic protection and energetic shielding during the soul retrieval process. Because they bring inner balance as they align the chakras and harmonize the meridians, they are excellent for vibrational healing. Smokey quartz is a premier grounding stone that helps you be more embodied and engaged with the world. The actions of the crystals inform the way the Turkey Tail Mushroom and Comfrey Flower Essences seat into the body/mind. While Turkey Tail and Comfrey Essences were being made spirit song coming through Diana’s voice was imprinted into each essence.